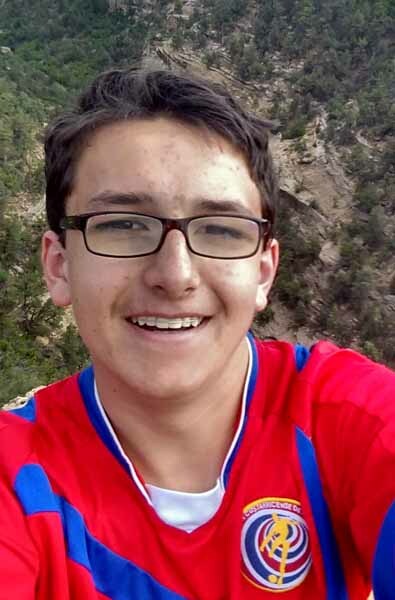 Swimming at Skyline High is not just a sport, it’s a lifestyle. Asking someone who swims for legendary coach Joe Pereria about her life and you are going to get the same answer 90 percent of the time – swimming. Swimming is how these people are wired and Becca Goodson is no different, but it wasn’t always that way. Goodson started swimming at six when her parents signed her up to teach her water safety. Little did they know that 10 years later their daughter would be competing for one of the best swimming programs in the state of Utah and defending a 100-yard butterfly state title. 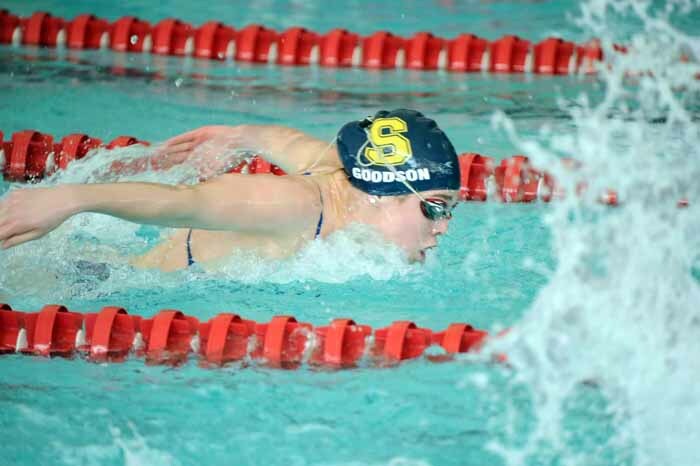 Goodson loves swimming and it’s influenced her life in so many ways. “It’s taught me to be a good leader, about dedication, about respect, its why I am who I am today,” Goodson said. At one point in her life though, Goodson almost lost the passion that made her the person she is today. “It was the hardest summer of practices I ever had,” Goodson said. Long hours spent in the pool swimming back and forth, back and forth with one goal in mind – win and beat the clock. Swimming is a unique sport because you are racing two separate opponents – the competitors in the lane next to you, and the one that stares down with judging eyes just adjacent to the pool – the clock. “I was so focused on my times,” Goodson said. She forgot about her attitude, her friends, her entire life that summer. All focus went to beating the clock. She went into the next season with one thing on her mind – winning and winning big. The Skyline sophomore had worked so hard and put so much time into what she did and she wasn’t seeing the results she wanted. The first response for Goodson was to work harder, but after a few more weeks of grueling training every day in the pool, Goodson was done. “I wanted to quit, I just felt like people who didn’t put as much into it as me were beating me and kind of thought how is this fair?” Goodson said. Quitting, however, was not an option for Goodson, she’s not that kind of person. Instead of going back to work though, Goodson stepped back, refocused and gained a completely new perspective for the sport she loved. “I forgot why I love swimming so much, I forgot it wasn’t all about winning,” Goodson said. She saw swimming in a different light now, “It wasn’t I have to swim, it was I get to swim,” she said. Goodson found what she was lacking – positivity. It’s not just wanting to be at practice for Goodson, it’s about making practice enjoyable. If you want to make a swim practice negative it’s easy to do that. It’s more challenging and helps the team more if you make it positive. The change in attitude made all the difference. 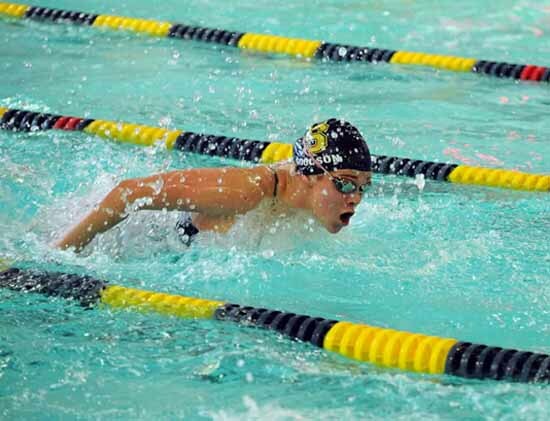 The wins started coming and coming fast and she won the state title in the 100-yard butterfly her freshman year. There is so much ahead for Goodson. 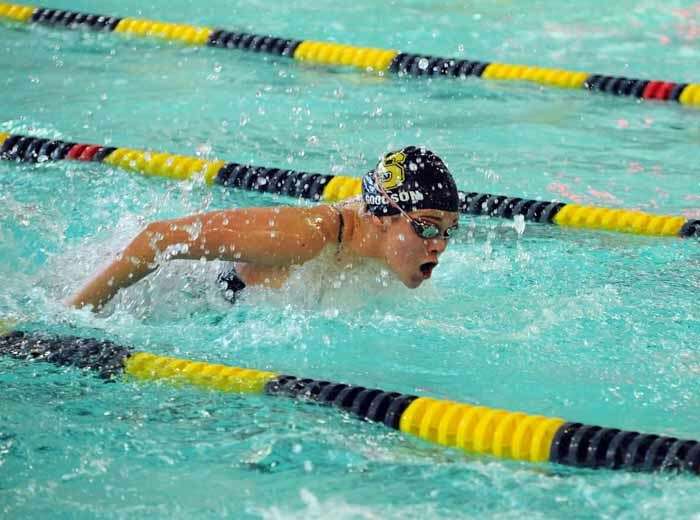 She’s just a sophomore and at this year’s state event she won gold in the distance events, the 200 and 500 freestyle. It’s about hard work and it’s about respect. It’s not all about winning for herself anymore for Goodson, it’s about making the team better and it’s about enjoying what she’s doing. And it’s working swimmingly.